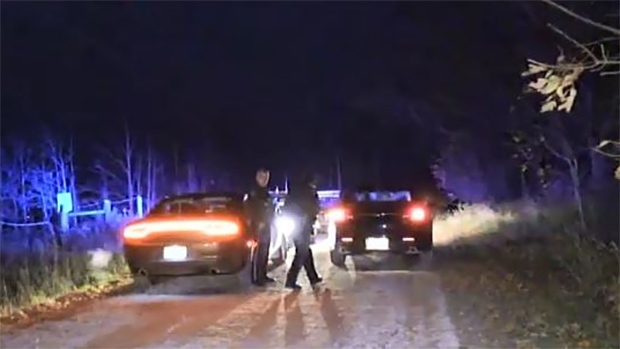 A major investigation is underway in Middlesex Centre after the bodies of two males and a female were discovered in a vehicle near Oneida of the Thames First Nation. Police were called in around 10 a.m. Sunday after the discovery of the bodies in the area of Bodkin Road and Jones Drive, southwest of London, Ont. Police are calling the deaths suspicious. The nature and cause of the deaths is still under investigation. The OPP Major Crimes Unit, OPP West Regional Criminal Operations Branch, Forensic Identification Services, the Coroner’s office and the Ontario Forensic Pathology office are all involved in the investigation. OPP Const. Max Gomez explains the challenges saying, "We were of course fighting darkness and inclement weather." Police have closed the area of Bodkin Road northbound at Jones Drive while they conduct their investigation. 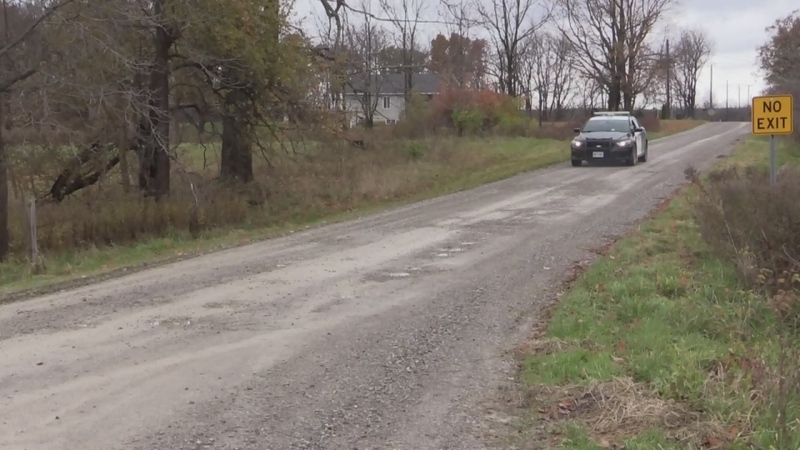 The bodies were found on a dead end gravel road on the border between Oneida and the county. A representative of the Oneida Council tells CTV News the deceased are not believed to be residents of the community because three missing would have already been reported. 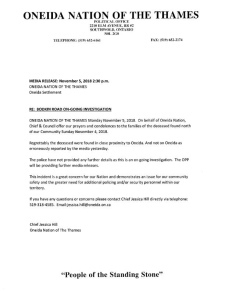 In a statement Oneida Chief Jessica Hill says, "This incident is a great concern for our Nation and demonstrates an issue for our community safety and the greater need for additional policing and/or security personnel within our territory." However, Gomez believes there's no immediate safety concern, saying, "Looking at the totality of the facts that we have at the moment, while of course it is concerning...we do not believe it to be an imminent threat to the public safety." Anyone with information on the investigation is asked contact the Middlesex County OPP Major Crime Unit at 1-888-310-1122. Police are investigating after several bodies were found in a vehicle near Oneida of the Thames First Nation, Ont. on Sunday, Nov. 4, 2018. 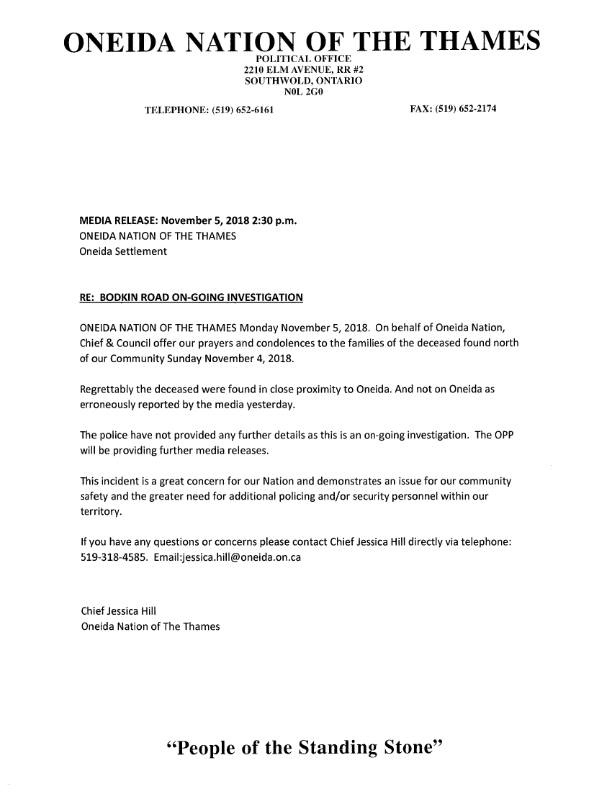 The Oneida Nation of the Thames has released a statement regarding the discovery of the bodies near their community.